Use twice daily, this concentrated, non-greasy silicone gel is clinically shown to improve and reduce the appearance, color, roughness and discomfort of old and new scar on face or body. 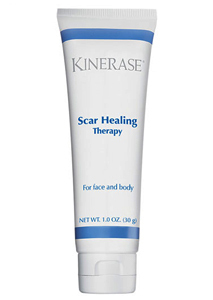 Both dermatologists and plastic surgeons recommend this patent-pending complex for red or raised scars. It forms a protective invisible barrier that softens, flattens, and smoothes scars, creating an ideal environment to normalize collagen production. These type of scarring can be a result from cosmetic procedures, plastic surgeries, general surgeries, C-sections, accidents, burns, and everyday cuts and scrapes.